Life In A House of Blue ! 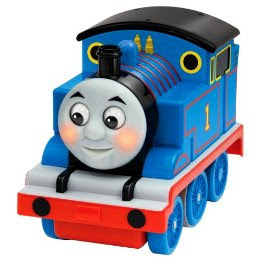 : Thomas The Tank Engine Toys = FUN ! Home > Review > Thomas The Tank Engine Toys = FUN ! 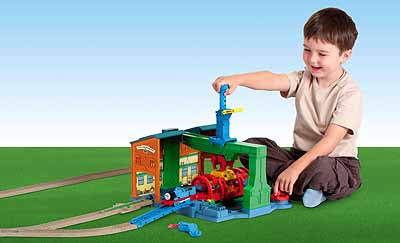 Thomas The Tank Engine Toys = FUN ! If you have kids that like trains and are a fan of Thomas The Tank Engine, I would like to introduce you to two great toys I had the opportunity to review! First is the Th omas The Tank Engine Let's Go Thomas ! When it arrived we had to test it out right away ! He comes already with the 3 "C" batteries that are required to make him run so he was ready to go! ( YES batteries included, you do not see that very often). The first setting we put him on was the follow setting and my son had BLAST with that! He actually comes when we call him! After having fun with the follow me, we moved onto Chase Me which puts Thomas in control of the adventure and it was tons of fun! His eyes and mouth really move. He sings and plays music (3 songs). "Chase-Me" mode let's Thomas lead the adventures. "Follow Me" mode put your little engineer in charge. See Thomas The Tank Engine Let's Go Thomas in action ! Let's Go Thomas takes little engineers on big adventures! He talk. He sings. He chugs along all by himself! With motion sensing technology he is a fully interactive friend that will get kids up and moving! With an adorable smile, blushing cheeks and bouncy chug, he really will spark their imagination! He can be purchased for around $49.99. Next is the TrackMaster Spin & Fix Thomas , I love this set!! I really enjoy watching my son use his imagination while he repairs Thomas. it cones with a electronic lights & sounds tool that lights up with simulated sparks and welding sounds while he repairs the engines which adds to the fun. The Trackmaster Railway System allows you to create a variety of different layouts and unlimited expansion. "When Thomas' trucks prove to be to o heavy, his brakes fail and he soars into a forgotten siding. There, Thomas discovers Hiro, one of the oldest engines on the Island of Sodor. But before Thomas can help his new friends, he need to repair his brakes at the Sodor Steamworks, the new and biggest repair yard on the island. Guide Thomas into the left and use the claws to pick hip up and hove him to the repair area. Use the spinner to turn Thomas and make your repairs. A light-up toll with real welding sounds effects helps to get the job done." This set can be purchased for around $49.99.